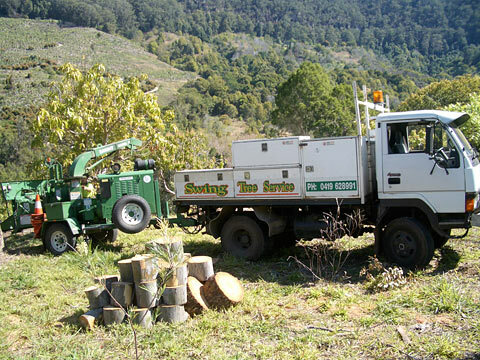 Swing Tree Service is based in The Channon and has been offering professional arboricultural and portable timber milling services by qualified, insured and experienced arborists for over 18 years. Chris Anderson is the owner and operator of Swing Tree Service and arguably one of the Northern Rivers top tree climbing arborists. 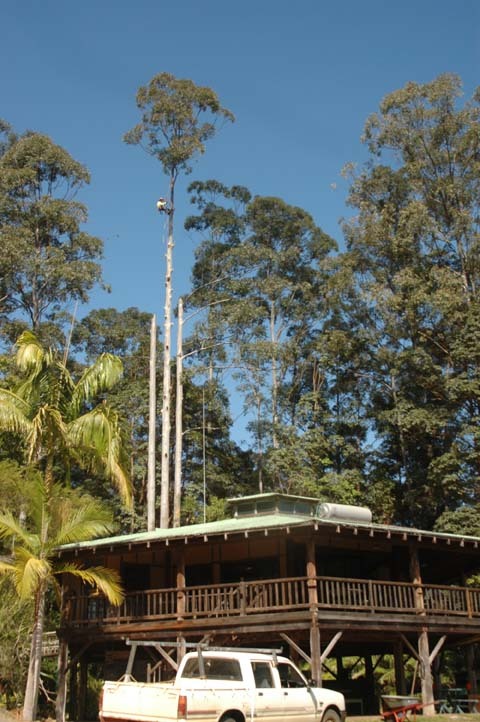 His tree climbing skills are recognized by many northern rivers arborists and organisations, who often subcontract Chris for their more difficult tree jobs. Our core crew of arborists are all qualified and carry relevant tickets, ensuring quality workmanship and best practice. Swing Tree Service has a range of equipment to complete most jobs including a 9" Bandit wood chipper, a small but robust 4 wheel drive tip truck which can get into many places that others can't and a stump grinder. Swing also has a full range of climbing and lowering equipment to safely remove branches from over buildings and gardens. Swing Tree Service offers a range of services, from small to large tree pruning or palm removal jobs to large scale Camphor Laurel clearing, maintaining the health of established trees, deadwood removal and taking down large trees in confined spaces. All aspects of tree work are completed with care and respect for the local environment and comply with industry standards and OH&S best practice. Chris's most notable qualities are his amiability and the speed and care in which he gets jobs done. As a compliment to Chris's tree business he also operates a portable saw mill. Useable logs can be milled on site to make valuable building materials and help offset the cost of tree removal. So no part of the tree is wasted. We now offer stump grinding. Stumps can be removed, saving years of trying to mow around or over old stumps, giving you back valuable lawn or garden space. Stump Grinding also eliminates the need for using poisons on some of the more difficult to kill trees. Contact Chris Anderson for expert advice and an obligation free quote on 0419 628 991.